July 6, 2018 / TheNewswire / Vancouver, Canada - Guyana Goldstrike Inc. (the "Company" or "Guyana Goldstrike") (TSXV: GYA, OTC: GYNAF, FSE:1ZT) is pleased to announce that the geological team has commenced trenching, sampling and mapping at the Toucan Ridge area on its Marudi Gold Project ("Marudi" or the "Property") located in the Guiana Gold Belt, Guyana, South America. Locke Goldsmith MSc., P.Eng., P.Geo., VP Exploration states "Trenching at Toucan Ridge is discovering lengthy exposures of quartzite-metachert, which is the host rock for gold mineralization. Therefore, this area has very good potential for additional discovery of gold and may be a priority drill target for our upcoming drill program." 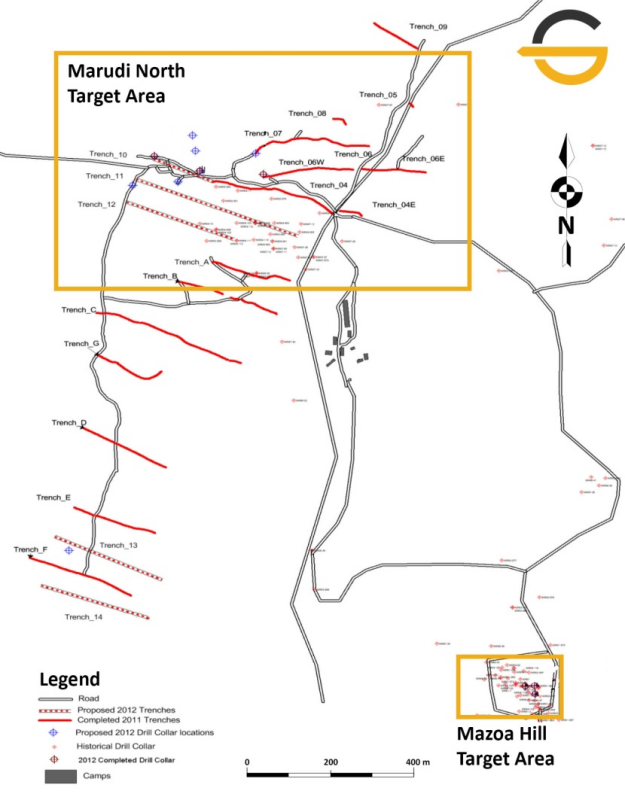 2012 location map showing drilling and trenching completed at Marudi by previous operators.